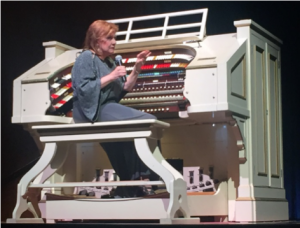 I first met Rosemary Bailey at the 2012 Los Angeles ATOS convention where she was demonstrating an electronic organ and found her to be charming and quite capable at the console. I’ve been looking forward to her performance here ever since I discovered she was on this season’s schedule and I wanted to hear what she could do with our great Kimball. She proved to be an accomplished, experienced, and skillful performer. 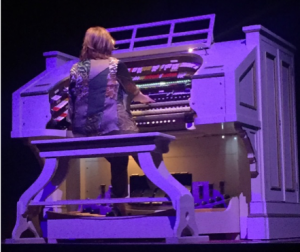 With her unique style of playing, she was able to give us a sound that I’m sure was different from what the audience is used to hearing. I personally found it both pleasing and amazing. Rosemary began her delightful program with a lite and lively It’s Today from the 1966 Broadway musical “Mame,” music and lyrics by Jerry Herman. This was followed by something a little more sensitive and a gorgeous arrangement of A Nightingale Sang in Berkeley Square. Written in 1939 by Eric Maschwitz and music by Manning Sherwin and first performed in the London review “New Faces” by Judy Campbell in 1940, and that same year by Vera Lynn and Ray Noble. It has become a standard and covered by many. The song bird favors rural habitats and is unlikely to be heard in central London. Rosemary next played a Tango, showing off some percussion sounds, written in 1935 by Carlos Gardel and lyrics by Alfredo Le Pera, Por una Cabeza (by only a head). The song is comparing an addiction to horse racing with an attraction to women. The song was used in a Tango scene in “Scent of a Woman” in 1992, in the opening scene of “Schindler’s List” in 1993 and in “True Lies” in 1994. Before playing the next tune, Rosemary reminisced a bit about her indebtedness to Kay McAbee, an ATOS Hall of Famer in 1985, and his influence in her development, after which she played You Make Me Feel So Young with a very fine arrangement. The music was by Josef Myrow and lyrics by Mack Gordon and introduced in the 1946 musical film “Three Little Girls in Blue” by Vera-Ellen and Charles Smith but their voices were dubbed by Carol Stewart and Del Porter. Notable recordings have been by Frank Sinatra in 1956, Ella Fitzgerald in 1959, Perry Como in 1960 and Michael Buble` in 2013. Up next was a lilting waltz by Leroy Anderson in 1951 featuring some tuned percussions in Belle of the Ball. It can still be found most recently in 2016 on “Blue Tango-Very Best of Leroy Anderson Light Classics” as 1 of 23 included pieces. Music from the opera Prince Igor in 1890 was next and was written by Alexander Borodin. Featured were themes from the Polovtsian Dances and Gliding Dance of the Maidens, which later were incorporated into “Kismet”. Featuring our French Horn, Rosemary shifted to a liturgical mood and in an amazing arrangement of Amazing Grace with Jesu Joy of Man’s Desiring. The latter is the common English title of a piece of music derived from the tenth and last movement of the Cantata (translated to Heart and Mouth and Deed and Life)) by J.S. Bach in 1716 and 1723. The first is a Christian Hymn published in 1779 with words by John Newton. It has been associated with over 20 melodies but in 1835 it was joined to a tune named “New Britain” and is now the most famous of all folk hymns. It is estimated that it is performed about 100 million times annually. Taking us into intermission with a one- word title tune Soon by George and Ira Gershwin in 1927. It was introduced by Helen Gilligen and Jerry Goff in the 1930 revision of the musical “Strike Up the Band”. It has been covered by many and to name just a few: Sarah Vaughan, Ella Fitzgerald, Oscar Peterson and Sammy Davis, Jr. The song was dedicated to two special people in the audience from an ATOS chapter in Massachusetts. The second half began with Brazilian Sleigh Bells a tune composed by the orchestra leader Percy Faith in 1957 and was followed by one of my favorites and an extremely lovely arrangement, I might add, More Than You Know. Music was by Vincent Youmans and the lyrics by Billy Rose and Edward Eliscu in 1929 for the Broadway musical “Great Day” and sung by Mayo Methot. The most popular contemporary versions were by Helen Morgan and Libby Holman. From then until now, there are way too many versions recorded to mention. From the pen of David Rose in 1942 came Holiday for Strings and became the theme song for “The Red Skelton Show” for over 20 years. George Wright covered the tune in 1984 on his “Red Hot and Blue” album. Bringing the concert to an end, Rosemary, after saying, “attempt to entertain us”, played the Overture from Barber of Seville, an opera by Gioachino Rossini premiered on 20 February 1816. Bravo! For the encore, she selected a very fitting tune for the evening, Get Happy. This is a Harold Arlen tune with lyrics by Ted Koehler and introduced in 1930 in “Nine-Fifteen Review”. The song is most associated with Judy Garland. I enjoyed the evening and don’t think I need to add anything more than the first paragraph of this review. Great show Rosemary!